Innovation is a tradition at Boker. This folding knife, the Eurofighter II, offers a lot of features, technical and cosmetic. The sleek lines of the aluminum handle follow the smooth lines of the 154 CM blade with its rich satin finish. The black hardcoat anodized handle fits perfectly in your hand. The pocket clip keeps the knife both safely attached and readily available in your pocket or on your gear, without being bulky. In keeping with the innovative design, Boker‘s Twin-Pin Lock is used here for the first time. This radial bolt securing mechanism differs clearly from existing locking mechanisms on the market, and locks through the blade pivot. The blade of the Eurofighter II can be opened quickly and easily without using the safety mechanism. Includes a padded zipper pouch in a pilot design. Blade length: 3 1/2″. Overall length: 8 3/16″. Weight: 4.1 oz. Made in Solingen, Germany. Outdoor Edge is the leader in great and innovative hunting edges. The only thing worse than not having a good hunting knife, is having a good hunting knife and then loosing it. Thankfully, Outdoor Edge has brought out a blaze orange version of their popular Swing Blade hunting knife. This innovative hunter features a drop point skinning blade that can be rotated into the handle to reveal a gutting blade. The added benefit of this model is that it is made with a blaze orange Kraton grip handle, reducing the likelihood that you will leave it behind in the woods and not have it when you need it most. What a sharp idea! 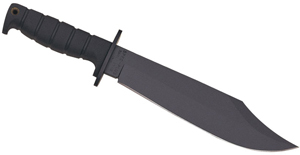 Blackhawk has some very targeted tactical products and this one is no exception. The HawkHook is a well made folder from Taiwan and will hit the mark for a lot of rescue workers – at the $31.95 introductory price! We are proud to offer this exciting line of lights from Cyclops. They have very creative designs including clamp on LEDs for hats, flashlights that turn into lanterns, and monster size rechargeable LED spotlights. Limited availability on this trapper with a special handle design. Only 251 pieces were made and, when wes ell through ours, there will be no more available. So, if you like Case knives, are a collector or want to be a collector, grab one! Now available in 2 sizes, The Citadel is a world class auto from Spyderco Knives. 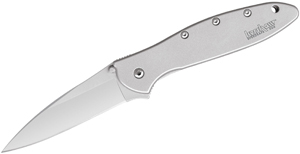 It has a strong aluminum handle and very fast opening, S30V stainless blade. The hole in the blade is decorative only, but lets you know its a Spyderco product. 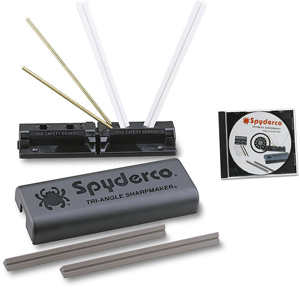 Spyderco has not released a lot of descriptive material, so check out our image and see what you think. Like all our automatic openers, they are only available to police officers and active duty military. We require a copy of your ID when you purchase them from us. Spyderco has come up with another winner with this Para Military model with the super hard and tough D2 steel. The G10 handle is foliage green.